Drunken chicken wings are really nice with cold beer or as a nice appetiser/starter. The chicken wings are full of flavour after the long marination. Can use other parts of chicken like whole wing, wing drumlets, drumsticks or use half /whole chicken. If using bigger piece of chicken or half/whole chicken poaching time is longer and needs more wine marinade. 1 chunk of ginger, cut into 6 - 8 slices. * For the shaoshing wine do use one which has a nice flavour. See this picture below, the square bottle is made in Taiwan and I find it tastes like medicine. 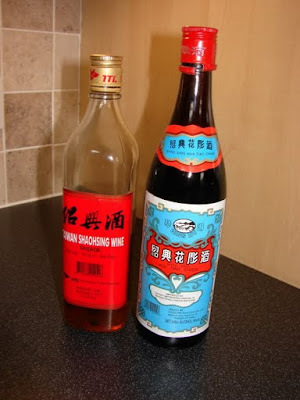 The blue label bottle is Shaoshing Hua Diao Wine 紹興花雕酒 is what I like to use, it is available in many large Chinese supermarket like Lung Fung (London) or Wing Yip. Poach the chicken wings. Put ingredients A in a saucepan, cover with boiling water. Bring the liquid to the boil, let this boils briskly for about 1 minute. Turn the heat off. Cover and let the remaining heat of the water to finish cooking the chicken wings, poach for 5 minutes. Drain and bin ginger slices and spring onion. Plunge the wings into icy cold water, let the wings cool down very quickly. Drain again. Shake off excess water. Put the wine marinade ingredients in a zippy or freezer bag, add in the wings and mix. Put the bag in a container with the sealed side on top to prevent leaking. Leave this in the fridge for 1 - 2 days, turning 2 - 3 times a day. 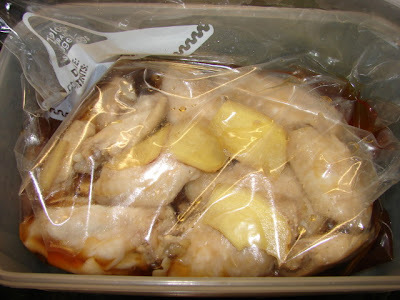 Marinate in a plastic bag needs less wine marinade and easy to turnover the wings. Take the wings out, serve cold or at room temperature. 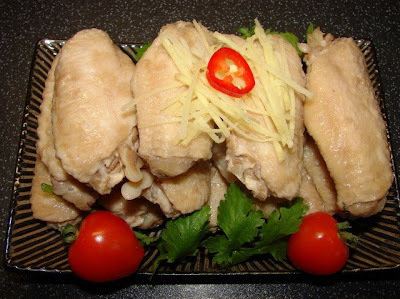 The leftover wine marinade can be reused or for other Chinese cooking. I can't wait to make this and it sounds simple! I have posted your very helpful chinese list on my blog that i share with my sisters. Thank you so much!